November 14 - January 13, 2008 HELD OVER TWO WEEKS! 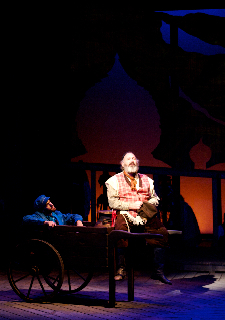 A known quantity can be a good thing, when it’s also a substantial quantity, and with his handsome staging of Fiddler on the Roof for the Olney Theatre Center, director John Vreeke makes it plain that this is one Broadway classic deserving the name. He’s got help, of course: No less substantial an actor than Rick Foucheux—that sly, subtle veteran of Shakespeare and Albee and Mamet and more—has been enlisted to play Tevye, the put-upon Russian Jewish paterfamilias who sings his famous paean to “Tradition,” then promptly finds himself swept up in an avalanche of social change. (Tutors preaching revolution, daughters angling to marry for love rather than at the matchmaker’s bidding, politics and pogroms undermining decades of hard-won peace with the neighbors—it’s been a hell of a year in Anatevka.) 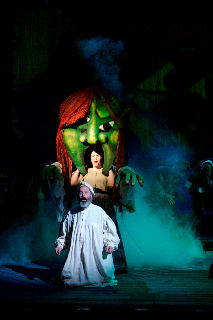 And Olney’s production budget puts a cast approaching 30 at Vreeke’s disposal, which means hair-raising harmonies, reasonably convincing crowd scenes, and rousing production numbers. Standout singers among the shtetl swarms include D.C. musical-theater favorites like Sherri Edelen (as Tevye’s unrelenting nag of a wife) and Jenna Sokolowski (as Hodel, the daughter who falls for the revolutionary), plus an entertainingly smooth New Yorker (Paul Downs Colaizzo) who’s been booked in to play the provocative boundary-pusher Perchik. But it’s not just the voices: The plot has a gratifying richness of texture (even if it simultaneously seems a trifle episodic, derived as it is from an assortment of Sholem Aleichem’s well-loved tales), and the tunes, from “If I Were a Rich Man” to “Sunrise, Sunset,” are sturdy, time-tested musical-theater artifacts that somehow don’t feel much dated. There are intriguing directorial touches, notably the one that keeps Andrew Zox’s jaunty Fiddler capering at the edge of the action like some elemental trickster, a Pied Piper of Anatevka, perhaps, at once haunting Tevye’s dreams and anchoring him in the bedrock of that all-important tradition. Most critical is Vreeke’s knack for taste and tone: There’s nothing kitsch about this Fiddler. It’s as serious, and as substantial, as Foucheux’s brooding, thoughtful, tremendously human hero. 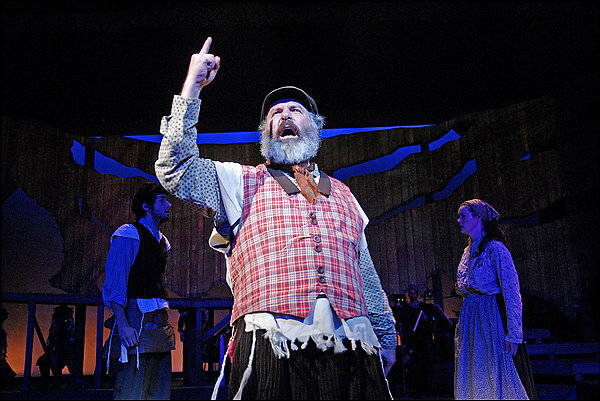 The critical chatter about Olney Theatre Center's well-received "Fiddler on the Roof," now running through Jan. 6, has focused on the somber undertones in director John Vreeke's staging, and on Rick Foucheux's equally layered acting as Tevye. "A number of the reviews said, wow, he deliberately went for a dark approach. Well, I didn't deliberately go for that," says Vreeke (pronounced vraykey). "I went for as much honesty as I could find. And I feel Rick went for all the humor that's there. . . . He gets every bit of humor that exists in the context of the text." 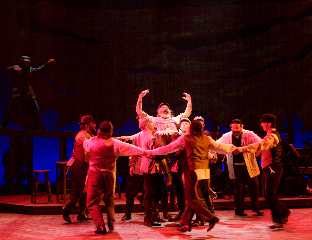 As life worsens for Tevye and the other Jews in the Russian village of Anatevka, circa 1905, Vreeke frames them against projections of van Gogh skyscapes that darken as the celebratory tone of Act 1 gives way to the grim events of Act 2. In the finale, after the Jews of Anatevka are expelled by Cossacks, Vreeke has his actors walk up a ramp that represents a road and into what he calls a "black void." Some see that as a reference to the death camps of the future. Vreeke says he didn't intend the image to be literal. "I wanted to see everybody go off and away. And then after that, that's another story, whether they go to . . . America or they go to Brazil or they go to France. . . . The point I was making is that, just like always, the Jews have to leave." Foucheux takes Vreeke's stage picture more literally. "There is hope in this play in that we know the basic fabric of humanity goes on. But when we're marching off there at the final moment, it seems to me it's very presaging of what's to come. . . . So it's a play that I think puts a question mark on the word 'hope.' "
A two-time Helen Hayes Award winner known for his work in contemporary non-musical plays (his second Hayes was for the baseball-besotted gay accountant in Studio Theatre's "Take Me Out") as well as Shakespearean and Restoration roles, Foucheux (pronounced fo-SHAY) says playing Tevye has stoked his love of acting. "I have discovered some new tools in my toolbox and it's fun. It's re-sparked my love of it," says Foucheux, 53. Tevye is "a great role for someone who's not all that used to doing musicals," Foucheux says, "because the music is accessible." He worked all summer with music director Christopher Youstra to get comfortable with the songs. Vreeke says he wasn't looking for "Pavarotti-type polish" but someone able to handle the songs like a natural extension of the dialogue. The Olney Theatre Center has the resources and ambition to do big musicals well, and that seems to be the subtext as the village of Anatevka springs to life in John Vreeke's robust, deeply serious production of "Fiddler on the Roof." 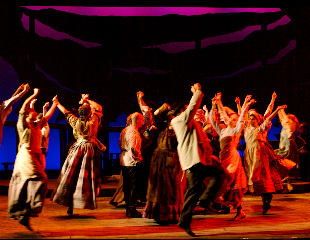 It's boldly sung and athletically danced, and although there are flaws enough to keep it from being really thrilling, this "Fiddler" is one of the Olney's best recent forays into musical theater. The sheer vitality of the piece is indomitable, even if Vreeke's staging has a darker dramatic lining than "Fiddler" often gets. A certain amount of darkness, of course, comes with "Fiddler," the beloved 1964 musical based on the stories of Sholom Aleichem. The setting is 1905 Russia, and while the tale deals with evolving traditions as the beleaguered dairyman Tevye's daughters get married without his help, larger issues lurk. A pogrom is threatened and eventually scatters the Jews of this little town. 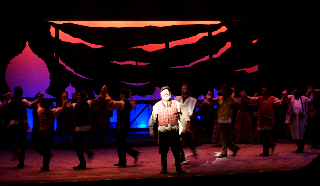 Luckily, the production has good ballast in Rick Foucheux's faintly tragic yet appealing Tevye. Foucheux doesn't exactly fit the usual mold of Tevyes: There is little of the clown or inveterate entertainer about him. Yet from "If I Were a Rich Man" and ever after, there is a poignant hopefulness in his delivery. It is, as always, a pleasure to be drawn into Tevye's dilemmas with his daughters (the suitors! ), his wife (the nagging! ), and God (life!). 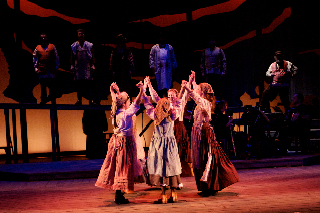 And although this Tevye isn't a natural dancer -- nor a gifted singer, though Foucheux's voice is fair enough -- he beams each time he's lured into Gabrielle Orcha's celebratory choreography. The dancing follows the familiar Jerome Robbins mold, from the spiraling energy of "To Life" to the bottle dance as Tzeitel, Tevye's eldest, happily marries the poor tailor Motel. Such old-fashioned, stage-filling production numbers often trip up local troupes, but they send this show toward its buoyant peaks. The cast is generally winsome, starting with the wide-eyed sisters (Patricia Hurley as Tzeitel, Jenna Sokolowski as Hodel and Margo Seibert as Chava) singing the eager "Matchmaker." The supporting acting sometimes skids toward caricature, though, and even Sherri L. Edelen, a splendid presence in so many local musicals, seems uncomfortable to be rendering Tevye's wife as an unrelieved battle-ax. But something always snaps the show into gear. At one point it's the elaborate staging of Tevye's dream, complete with stage-filling fog and a puppet so large that it takes two actors to operate. At another point, it's the sly humor of Hodel's oddly formal courtship with the revolutionary-minded Perchik (the amusingly grave Paul Downs Colaizzo). And the songs nearly always find the sweet spot, whether it's Andrew Boza bringing a pure vocal and a true sense of surprise to Motel's "Miracle of Miracles" or the whole ensemble harmonizing on the haunting "Sunrise, Sunset" and "Anatevka." The sound design is sketchy, with speaking and singing sometimes so overmiked it sounds like a bingo hall (and this happens around town a lot, too; apparently it's easier to build fancy theaters than to smooth out the sound). Yet the enormous, well-drilled chorus easily keeps the upper hand with the inevitably undermanned onstage orchestra, a folksy ensemble anchored by fiddle and clarinet. The vast human scale of the production goes a long way, but as always with "Fiddler," audiences must reckon primarily with Tevye. This one's compelling: Foucheux's sad-eyed, deep-voiced Tevye tugs his cart like Mother Courage, and he pulls the audience with him. Tradition is broken in director John Vreeke's dark-tinged vision for the venerated 1964 musical "Fiddler on the Roof," but on the whole, the changes make for a deeply textured, triumphant production, playing through the holiday season at Olney Theatre Center. Set in pre-revolution Russia in 1905, "Fiddler" tells of a traditional Jewish community forced to deal with sweeping social and political change. The move from the "old ways" to tentative new beginnings is charted in the vigorous score by Jerry Bock and Sheldon Harnick, which features the classic tunes "Matchmaker, Matchmaker," "Sunrise, Sunset," "If I Were a Rich Man," "Do You Love Me?" and "Tradition." 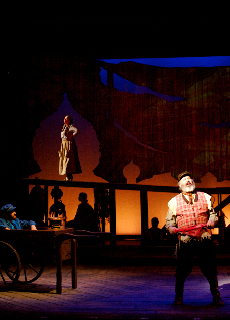 Mr. Vreeke's talent for creating well-defined characters and strong performances starts with Rick Foucheaux's Tevye, the dairyman from the tiny Russian town of Anatevka who is beset by a shifting world. With his resonant voice and dramatic sense of gravity tempered with rueful humor, Mr. Foucheaux is perhaps the most serious-minded Tevye you've ever seen; the role usually is played with an eye toward broad entertainment. His Tevye is sad-eyed and stooped, as if he's burdened with cares. Mr. Foucheaux's singing voice is passable, and he's no dancer, but he makes the most of what he's got. The perfect casting continues with Tevye's forward-thinking daughters (Patricia Hurley, Jenna Sokolowski and Margo Seibert), who bring dash and loveliness to their big number, "Matchmaker." 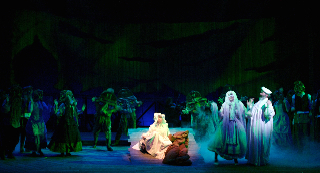 Miss Sokolowski is particularly fine as the middle daughter, Hodel, who goes off with her fiancee, Perchik (the sweetly serious Paul Downs Colaizzo) to exile in Siberia, and her farewell song, "Far From the Home I Love," is tinged with wistfulness and longing. Andrew Boza also distinguishes himself in the role of the poor tailor Motel, who sings "Miracle of Miracles" with a beguiling sense of naive surprise. Some of the more veteran actors do not fare as well — the usually strong Sherri L. Edelen overdoes the battle-ax routine as Tevye's wife, and Karlah Hamilton seems to be channeling Molly Picon in her portrayal of the meddling Yente. Gabrielle Orcha's lissome choreography pays homage to the original steps by Jerome Robbins — as seen in the traditional Jewish dances. It doesn't hurt, either, to have a classically trained dancer and mime playing the Fiddler — Andrew Zox, who brings honed intensity to the role. Jon Savage's two-level, conceptual wood-plank set seeks to break free of the musical's initial inspiration — the paintings of artist Marc Chagall — but the shredded backdrop puts you in mind of a shmatte. The melancholy lighting by Charlie Morrison seems to enforce the production's somber tone. Mr. Vreeke's concept for the show works wonderfully well, although missteps exist. The dream sequence is a dissonant nightmare complete with masks, puppets, shrill music and other queasy flourishes that looks like something Julie Taymor might have conceived after a spicy late-night meal. The ending may disturb "Fiddler" traditionalists, as Tevye and the rest of the village somberly troop up the ramp as a massive wooden door swings open, and everyone disappears into a black void. Making allusions to pogroms and the Holocaust seems heavy-handed and unnecessary, especially when you consider the original ending is touched with a ray of optimism. Many Russian Jews would be going to tragic fates, but for some, like Tevye and his family, newness and opportunities await them as immigrants to America. Why fiddle with "Fiddler"? It's not as if the show needs fixing. "A production has been developed with their own creative outlook..."
Four decades after it opened its multiple Tony award winning Broadway run of 3,242 performances this musical continues to be an audience pleaser. The plot is uncomplicated; the fictionalized lives of small village Jews in Eastern Europe at the turn of the 20th century as the modern world impinges on them. The Olney Theatre production is very solid throughout with Helen Hayes Award winners Rick Foucheux and Sherri L. Edelen in the featured roles. The upbeat, infectious and beautifully rendered songs of the first act are especially gorgeous and carry the production through its less fulfilling and speedy second act. 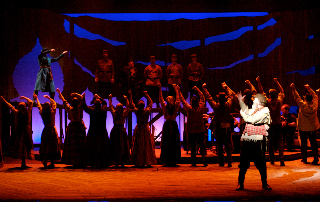 Fiddler certainly remains worthy of revival. It is a show that could be on auto-pilot and would still receive a standing ovation for those familiar with it. One wonders if Fiddler will find itself becoming a niche production with a less universal message as America’s demographics continue to change and other immigrant stories of love, loss and relocation are finally told. Storyline: Fiddler on the Roof is loosely based upon the stories of the Yiddish writer Sholem Aleichem (1859-1916) with his everyman character Tevye. Tevye lives to keep tradition alive. It is tradition that provides safety from the infringements of the adjoining world. But, the outside world comes crashing down on him, his family and his tiny village of Anatevka. Always buffeted, Teyve must come to terms with the unexpected in his life. Like a fiddler playing on a roof, Tevye must find his balance. Director John Vreeke has a difficult artistic task. How to revive a show that so many know from an Academy Award winning film and a play that has been revived four times on Broadway, including as recently as 2004? With musical director Christopher Youstra and choreographer Gabrielle Orcha, a production has been developed with their own creative outlook without irritating those who come to see what they remember (read “tradition”) rather then something new and off-putting. This is also not a stripped down revival with second rate actors and voices; this production has 25 cast members and a small 5-piece band all up on the stage and in full view. The lyrics and music by Jerry Bock and Sheldon Harnick include audience favorites such as the opening number, "Tradition," that draws the audience into the show immediately with its tale of how life is to be lead with unchanging assigned roles and responsibilities. With the full cast singing (assisted by microphones) the feel is one of a big production number. "Sunrise/Sunset" is the emotionally touching poetry of a parent’s feelings pouring forth at the letting go of a child. The night time hallucinations of "Dream of the Tailor" includes delightful large puppet heads and arms used expertly in this one tricked-up scene. Rick Foucheux is Tevye, the husband and father who argues not only with his wife, daughters and neighbors, but with God Almighty as well. With his baritone voice, his singing is what it should be; not sweet and striking but substantial and a bit off center. In his "If I Were a Rich Man," the upbeat lament of a man without money, the words don’t matter as much as the charm of Foucheux as he delivers it. Sherri L. Edelen plays Golde his wife with a broad comedic outlook. She fills the theater with her strong presence. When Edelen has the chance to sing solo or bring her voice to the fore within a larger group, the beauty of her signing voice is magnetic. As the daughters Patricia Hurley, Jenna Sokolowoski and Margo Seibert are each a charmer in her own way. When they sing together their harmony is captivating. The daughter’s suitors are Paul Downs Colaizzo as a way-too-timid local tailor who marries the eldest; Andrew Boza as the radical and intellectual teacher from the big city who marries the middle daughter, and Evan Casey as the non-Jewish Russian who courts the younger one through the love of books. 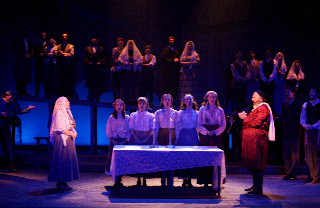 It is their marriage that is a major faith-related crisis for Tevye - does he follow tradition and consider his daughter dead to him since she married outside of her faith, or does he forgive her and give his blessing? Andrew Zox is the mute “fiddler” who, with his lithe body, makes his presence felt throughout the production. Finally, in the wedding scene toward the end of Act I, there is the marvel of a small kick line of dark clothed men with dark hats, arms entangled, moving up and down, sometimes with their knees touching the floor, dancing expertly, each with a bottle on his head. Absolutely magical!! The set is elevated from the floor with a long ramp for Tevye to pull his cart to the main stage area and for the townspeople and Russian troops to enter and leave. In one procession of townspeople, as the house lights are dimmed, the lighted candles carried by the townspeople are simply stunning. The set area is loaded with trap doors and elevators that are used to give additional movement and dimension to the production. The 5-piece band including adept fiddler and clarinetist is tucked into a corner of the main stage area, but dressed as townspeople in full view of the audience. Note: The Fiddler title comes from a surreal painting by Marc Chagall … the fiddler is a metaphor for survival, through tradition and joyfulness when life is uncertain. Olney Theatre Center for the Arts is located on Maryland Route 108 (Olney-Sandy Spring Road) in Olney, Maryland, one and one-half miles east of Georgia Avenue (Route 97) and two miles west of New Hampshire Avenue (Route 650). Parking is free. Take Georgia Avenue (Route 97) North. Follow Georgia Avenue north approximately 18 miles to the intersection of Georgia Avenue and Route 108 (Olney-Sandy Spring Road). 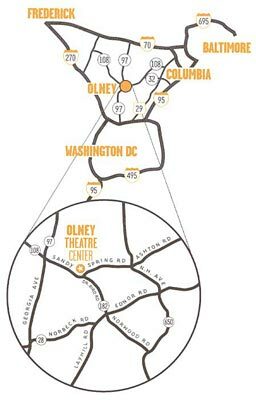 Turn right onto Route 108 and travel one and one-half miles to Olney Theatre Center, which will be on the left. Take New Hampshire Avenue (Route 650) east approximately 18 miles. Make a left on Norwood Road. Follow the road as it becomes Dr. Bird. Dr. Bird will dead end at the entrance to Olney Theatre Center. From I-495 (Capital Beltway), take Exit 33 (Connecticut Avenue, Route 185) toward Kensington and travel approximately eight miles to the intersection of Connecticut and Georgia Avenues (Route 97). Turn left onto Georgia Avenue and travel north five miles to the intersection of Georgia Avenue and Route 108 (Olney-Sandy Spring Road). Turn right onto Route 108 and travel one and one-half miles to Olney Theatre Center, which will be on the left. Take I-95 south to Route 32 west. Follow Route 32 west to Route 108 west. Travel on Route 108 west for approximately 10 miles. Olney Theatre Center is on the right (two miles from the intersection of Routes 108 and 650). Parking is free for all patrons. Parking spaces for patrons with disabilities are located in the first row of the parking lot, closest to the theater. Patrons with disabilities who cannot easily use stairs or walk distances may be dropped off next to the lobby doors between the theater and the actors' residence (Crawford House). Sunday, 12 noon - 5 p.m. Fiddler on the Roof still resonates today. “This is a story about a man, his relationship with God, and his unfailing love for his family. It is also about a struggle of a people to survive, to live, and to be at home, and how a belief system creates and also destroys life. It is a very pertinent play to do in 2007,” said Stage Director John Vreeke. This is Vreeke’s directorial debut at Olney. He most recently directed Wooly Mammoth’s Martha, Josie, and the Chinese Elvis to much acclaim. 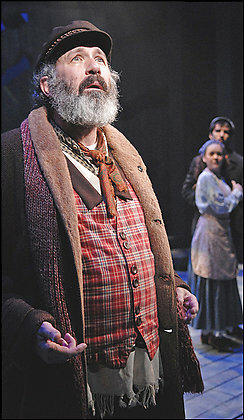 Tevye, will be played by two-time Helen Hayes Award winner Rick Foucheux. This will be Foucheux’s first appearance at Olney. He most recently appeared in Dead Man’s Cell Phone at Woolly Mammoth Theatre Company, where he is a company member. His wife, Golde, will be played by Sherri L. Edelen. Edelen has performed in the national tours of Big and Nunsense. Her regional credits include Sunday in the Park with George and Merrily We Roll Along at The Kennedy Center. Sherri received the Helen Hayes Award for Best Actress for Side Show at Signature Theatre. The eldest daughter Tzietel will be played by Patricia Hurley. Hurley returns to Olney having performed in Godspell, 13 Rue de L’Amour, Cinderella, and The Heiress. The second sister, Hodel, will be played by Jenna Sokolowski. Sokolowski’s credits include Cinderella at Olney, The Jungle Book at Imagination Stage, and Urinetown (Helen Hayes Award for Best Supporting Actress) at Signature Theatre. Margo Seibert just finished performing in Olney’s Of Mice and Men and in last season’s Cinderella. Seibert will play Chava, the middle sister. 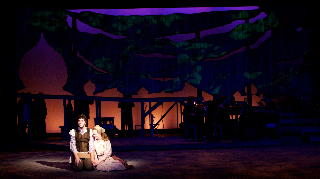 Fiddler on the Roof, book by Joseph Stein, music by Jerry Bock, lyrics by Sheldon Harnick. Directed by John Vreeke. Musical director, Christopher Youstra; costumes, Howard Vincent Kurtz; sound design, Jarett C. Pisani. With Kate Arnold, Rachel Blaustein, Sara Brunow, Evan Casey, Michael A. Crea, Jamie Eacker, James Garland, Lily Goldberg, Karlah Hamilton, H. Alan Hoffman, JJ Kaczynski, Timothy Dale Lewis, Amanda Montell, Natalie Perez-Duel, Zack Phillips, Carl Randolph, Ron Sarro, Kyle Schliefer, Mary C. Sheehan, Jordan Silver, Chris Sizemore, Mike Vires, Harry A. Winter and Andrew Zox.